Work, technology, the fact that we live in a society that tends to encourage sitting and looking down, places us into situations where we’re constantly compromising any good posture we might inherently have. We’re looking down at devices, sitting in chairs for hours on end, and therefore train ourselves to have rounded shoulders, tucked hips and protruding chins. We’re typically carrying things from place to place and it’s easy to overlook the effect all this has to our overall health. Posture facilitates breathing: Good posture naturally enables you to breathe properly and there’s a noticeable difference between the amount of air you can inhale when sitting up straight and when slouching. Yoga, Pilates and meditation exercises facilitate awareness and strength toward getting your sitting and standing posture correct. Better productivity: Because our brain requires oxygen to do any job correctly, the more air you breathe in, the more oxygen you supply. Oxygen is food for the brain and food for the brain leads to more thoughts and ideas. Improve your projected energy: Have you ever noticed that people with good posture naturally exude an aura of assertiveness and appeal? When you have a good posture, it helps to make you feel more self-confident, without even doing anything else any different. Try sitting with bad posture for 30 seconds then switch to good posture for 30 seconds. See how it makes you feel. Avoid health complications: Bad posture results in several complications over time, such as increased risks of slipped disc, back aches, back pain, pressure inside your chest and poor blood circulation. Many of these issues can lead to permanent disabilities if not changed and they’re all preventable simply with the practice of good posture. Good posture improves aging: the stronger you are in your core, the better quality of movement for the entire body and the better quality of aging you experience. Most people believe good posture means keeping your spine completely straight all the time but standing straight all the time is actually a strain on the body and should be avoided. Good posture is directly related to maintaining 3 natural curves of your spine. The cervical curve at the base of your head down to your shoulders, the thoracic curve from the base of your neck to the base of your rib cage, and the lumbar curve below the rib cage to the base of your spine. Image that string again. These curves are all tied into it as a natural alignment. When you are in the right posture, it should feel almost effortless to maintain. When you stand, the weight of your body should be evenly distributed across the balls of feet as opposed to the heels or the front or your foot. When standing or sitting, imagine your body being held by a string: Envision a string going through the spine and up through your head. If you are lying down, that string would become solid and be held directly parallel to the ground. If you focus on maintaining that straight line through the string and relaxing the rest of your body around it, you may find you need to drop the chin a little, bring the shoulders back a tad and stand with your weight evenly distributed on both feet. Get a head, shoulder and back massage: If you have always struggled with posture and/or have one area of the body that is a challenge to relax, consider getting a massage to loosen tight joints or areas around the spine, such as the neck, to make is easier to get into better posture and start making that posture a mindful practice. Your body will eventually adjust and create a new posture that is a new normal. Cut back on habits that cultivate bad posture: Watching TV, reading, typing on a computer, too much use of technology such as gaming devices and cell phones can cause slouching. Eliminating those activities might now be practical but cutting the use of them back even just a little bit can make an impact in posture. Try limiting your time on those devices and when you do, stretch the body a little afterwards to release tight muscle that stay in place afterwards and hold the spine in a slouch position. 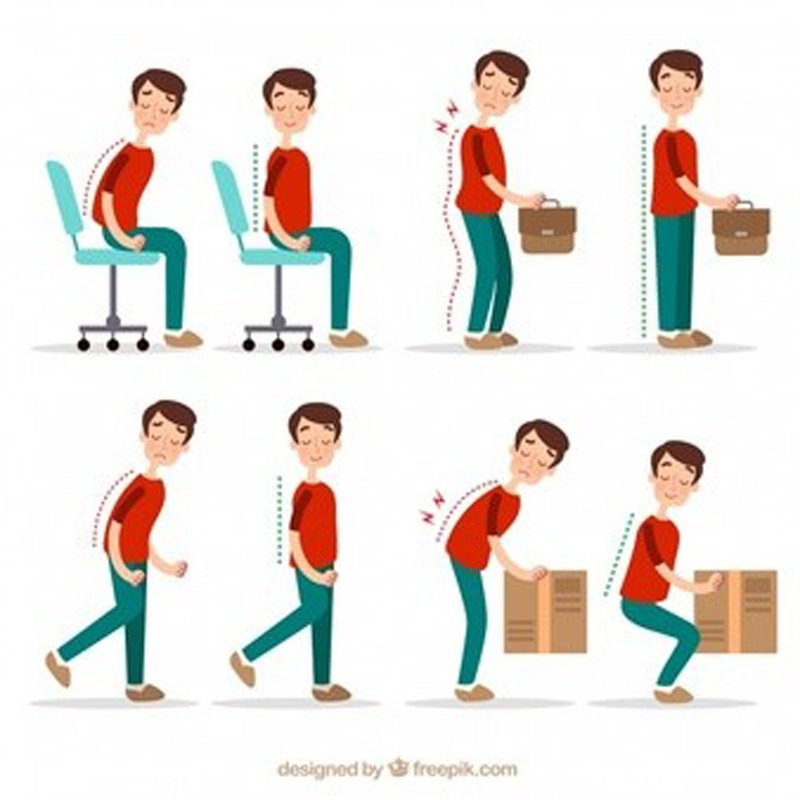 Get a good quality office chair: Support your body in its attempt to uphold good posture. While sitting, be sure you have a supportive chair that is sufficiently firm and has a dense cushion with back support. Place your rear at the innermost edge of the chair as opposed to sitting far to the back. This will inherently help you keep both feet flat on the ground and you’ll naturally be inclined to sit tall with that string image in mind. Ground both your feet firmly when standing or sitting. Both feet should be planted flat on the floor and not resting your weight on a particular foot. Avoid crossing the legs when sitting. Strengthen your back: Exercises such as, Pilates, yoga, exercise balls and stretching help strengthen the small muscles that support your spine and help create strong, healthy posture. Be sure to strengthen all layers of your core, working from your deepest layers of the abdominal muscles, which are up against the spine to the surface layer, often referred to as the 6-pack. Seek out a professional assessment: If you have an extremely bad posture and a history of back injuries or back pain, consider a visit to a chiropractor or physical therapist for a professional assessment of your posture. He/she can advise you in stretches and strength exercises to improve the posture and strength of your back.